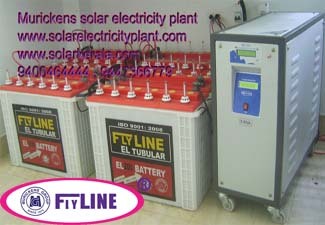 Murickens Group has developed a fully automatic sine wave solar stand alone power generating system for the smooth working of our domestic and commercial, electric and electronic equipments of lower and higher capacity and we can even operate sophisticated equipments which need a continuous and constant output. It is the most suitable solar power generating unit for the climatic conditions of Kerala as we can connect Solar power as well as AC power according to our discretion and this system provides 24 hours continues power supply throughout the year. This independent whole power device consist of a solar ups, built in or external charge controllerand storage high power tubular batteries. It is an economical and pollution free independent solar power plant having no need of grid or external power and this can be installed anywhere there is sunlight without any licence or permission of the local body or the Governnment and the Ministry of natural renewable energy (MNRE) provide subsidies for this project. Being the pioneers, we have made a place of our own in the field of solar based power units since our installation in 2000 and have done thousands of solar power unit plants in many places including The Agricultural University, Malapuram, Government of Kerala, The CISF 7th battalion military camp, International Airport, Karipoor, ISRO Sreeharikotta, Marine Fisheries Dept of India, Vallarpadam Container Terminal (IGTPL) TCS Info Park Cochin etc which are only a handful among our highly reputed clients in addition to a lot of other private organisations.. In order to avoid some unpleasant situations and for the smooth functioning of the system it is strongly recommented that the services of a qualified and experienced technician is sought without fail. 9) When grid returns during which inverter is working on buffer battery backup then the load is shifted to grid & batteries are charged through solar or grid as per logic explained above. 19 Solar charger-built-in Floating type & Trickle charging. Floating type & Trickle charging.